Dubai, United Arab Emirates, 16 August 2018: IKEA, the region's favourite Swedish home-furnishing retailer, has launched the 2019 catalogue in its 75th year, at an exclusive event at Marsa Plaza - Dubai Festival City, Residential Apartments by celebrating the many different needs that people have in their lives at home and inviting them to feel alive again. As one of the most widely distributed prints in the world, produced in 35 accessible languages, the catalogue is now available in the UAE. This year, seven homes have been created as the base for the IKEA catalogue. They each tell stories of different lives, and the catalogue invites the world to an “open house” in these homes which are filled with inspiration for everyday life. “At IKEA we are obsessed with life at home and each year we conduct in-depth research to further understand what matters to us all so that we can address real life needs in our catalogue to make people's homes better.” explains Vinod Jayan, Managing Director at IKEA UAE, Qatar, Oman and Egypt. Through research presented in the IKEA “Life at Home” report about people's needs and dreams for their homes around the world, having “too much stuff” is the single biggest cause of stress in the home. Globally, 27% of people think that society puts pressure on them to live minimally. 49% of people say that the main cause of their domestic arguments is due to clutter, and in many homes, there is a battle of clutter versus minimalism. “We want you to unshackle yourself from what you think is expected of you and rather make room for yourself at home, so you can truly feel alive again. Your home is a place to spend quality time and enjoy what matters to you the most. Whether you have a busy home with people of all ages under one roof, trying to create a calming space in a stressful city, or looking to live more sustainably – the new catalogue spread gives easy to follow steps to apply to your home. We are also happy to announce the launch of our new seamless online shopping experience. A fully integrated e-commerce website that allows you to shop from anywhere you are.” Vinod Jayan, Managing Director at IKEA UAE, Qatar, Oman and Egypt. 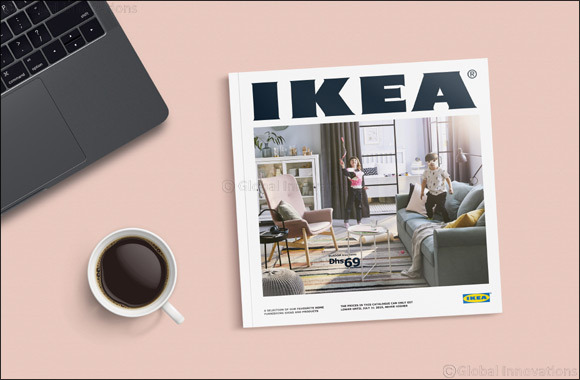 As it celebrates 75 years of IKEA's legacy, the new catalogue also includes a diverse range of furnishings and fittings for the home which reflect its Swedish heritage and other cultural influences from around the globe. True to its ethos, the 2019 edition is also full of features and content that not only offers design inspiration, but promotes the idea living sustainably and provides practical solutions in which to do so. IKEA stores across UAE will be inviting shoppers to join them in celebration of IKEA's 75 years birthday celebrations, over a course of continuous weekends through September to December, with numerous fun-filled family activities, children's workshops, cooking classes and workshops for adults.